Sizer 4.0 is latest version of the popular utility used to accurately resize and reposition windows. The latest preview version is available for download as an MSI installer sizer4_dev570.msi (292KB) or binaries only sizer4_dev570.zip (100KB). Better compatibility. Sizer has been completely rewritten to improve compatibility with modern applications including Windows 10 Apps. Sizer 4.0 is less intrusive than previous versions and therefore is more stable. Unfortunately this increased stability comes at a small price, some infrequently used features have been removed as a result. See the more details page for further info. Hot keys. Sizer actions, including bringing up the main resizing menu, can be assigned to a hot key that can be used at any time. e.g. by default pressing Ctrl+Win+Z brings up the Sizer context menu. This saves you hunting out the window border to right click it. Macros and expressions. Specify sizes and positions as formula. e.g. 0.7 * w:mon results in a value that is 70% of the width of the current monitor. With macros you can position several windows at the same time allowing you to layout multiple applications the way you want them. Further documentation will follow but in the meantime you can consult the railroad diagrams	for details of the syntax. Menu groups. Simplify and tidy up the Sizer menu by creating cascading menus with groups. Portable. 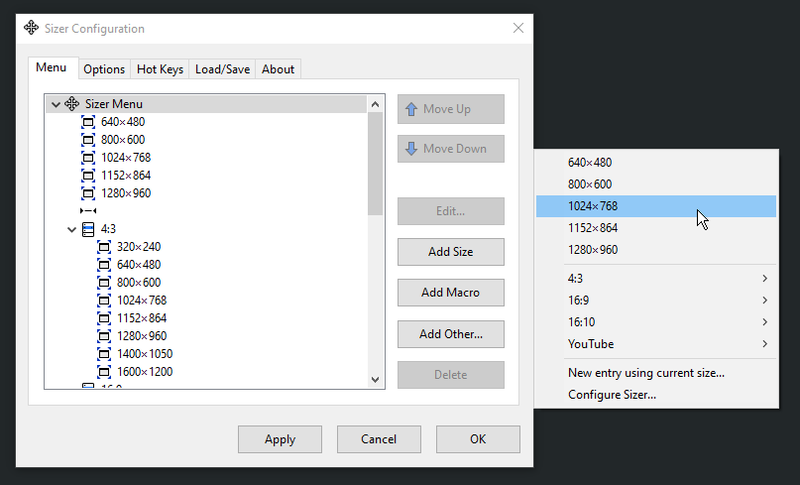 Run Sizer from a USB pen drive or keep your configurations in one place. Configuration file management. Export and import settings via the user interface. 29 May 2018: Implement "Current as new entry" menu action. Macro additions: option to control frame effect compensation; keyword to position relative to workarea; keyword to qualify windows by active desktop. MSI installer sizer4_dev570.msi (292KB) or binaries only sizer4_dev570.zip (100KB). 1 Aug 2017: Workaround for issues when DPI scaling is enabled. MSI installer sizer4_dev562.msi (292KB) or binaries only sizer4_dev562.zip (97KB). 30 Jan 2017: Fix so workarea/monitor coordinate option is saved to configuration file. MSI installer sizer4_dev556.msi (292KB) or binaries only sizer4_dev556.zip (97KB). 20 Jan 2017: Fix to prevent crash when height, width or position are empty. MSI installer sizer4_dev554.msi (292KB) or binaries only sizer4_dev554.zip (97KB). 5 Jan 2017: The initial preview version of Sizer 4.0. MSI installer sizer4_dev550.msi (292KB) or binaries only sizer4_dev550.zip (97KB).